The Beach Bash Music Fest at Rockstar Beach behind The Isla Grand Beach Resort. Home of the "Two Nation Vacation," South Padre Island, Texas is located on the tip of the longest barrier island in the United States. It is rated as one of the "Top Ten Beaches" in the world, making it one of the hottest destinations for Spring Break and Texas Week. South Padre offers lots of beachside activities each year during Spring Break. The fact that it is only 30 minutes away from Mexico is why it is called the "Two Nation Vacation." But, because of the drug wars between the the cartels, the Texas Department of Public Safety, urges Spring Breakers to avoid travel to Mexico. It is said that "everything is bigger and better in Texas" and Spring Break 2019 will be no exception. When you vacation on South Padre Island (SPI), you are surrounded with things to do!! You will find windsurfing, sailing and a host of other water sports on Laguna Madre Bay to the west. You can relax on the white sandy beach on the Gulf of Mexico to the east. You can explore the Padre Island National Seashore to the north. And last but not least, you can be in Mexico in a matter of minutes. South Padre Island is a growing international destination that depends on seasonal tourism. SpringBreakers provide a welcome boost to the local economy. The town works together with corporate sponsors to create special SpringBreak events that add to the exsisting recreational activities. You will find that most of the Spring Break events take place behind the major hotels like the Isla Grand. It is always a good idea to find a hotel room with a kitchen, or at least a microwave and a refrigerator. Condo rentals are also available in SPI and are a good alternitive to a hotel. Check with the tour operators, they book a lot of Condos and large blocks of hotel rooms for all the people they bring down by bus. Travel packages are available from several Spring Break tour operators. Check out the YouTube Clip. Night clubs are another essential ingrediant for a great Spring Break and SPI has several. Tequila Frogs overlooking Laguna Bay is one of the hottest clubs during SpringBreak. Last year they hosted the Maxim Monday event along with the MTV Real World Hosts. Another wired (WiFi) SpringBreak venue overlooking Laguna Bay is Louie's Backyard. There are a total of about ten nite spots on Padre Island, and don't forget Crazy Lazy and the other Mexican nite spots South of the Border. If you are going to go south of the border on your Spring Break 2019 trip to South Padre Island, sign up for the U.S. government's Smart Traveler Enrollment Program. It's fast, free, and in the govs' own words, "It allows the State Department to assist U.S. citizens in an emergency and keep you up to date with important safety and security announcements." Make a note of the U.S. consulate or consular agency closest to where you're staying. At travel.state.gov, look under Country Specific Information for a list of agencies in your destination. Send an email to yourself and fellow travellers and enter the information in your cellphone. There an app for that too! Download the Smart Traveler Program app for iPhone and Android. Tinder Blog | Get on Tinder and look for the Spring Break card. From there, you can add your Spring Break destination to see who’s going where. Let’s face it, the party is always wherever you’re at. PadreU will offer Spring Break 2019 packages from only $28 per person per night for a time, and increase with value-added amenities, such as meals, drinks, and excursions. The Beach Bash Music Fest at Rockstar Beach behind The Isla Grand Beach Resort runs from 12PM to 6PM. This is a ticketed event that features the largest stage on the beach. Formerly known as Coca-Cola Beach, Rockstar Energy Drink officially took over in 2016, providing a massive branded footprint at the Isla Grand Beach Resort that included thousands of free sample products such as drinks, souvenir t-shirts and other premium branded items. Rockstar also has exclusive stage branding rights and is also the official sponsor of the PadreManiac VIP Card. 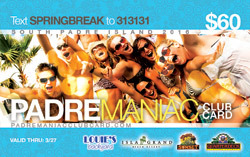 The most popular Spring Break Party Card in Panama City Beach for over twenty (21) years comes to Padre Island this year as the PADREMANIAC CLUB CARD. Here are some of the Daily Events planned for Spring Break 2017 at the Isla Grand and other venues at South Padre on the Chamber of Commerce website. The Monitor | Are you thinking of braving the traffic and tourists to spend your Spring Break at South Padre Island? If so, you should know what you’re getting yourself into — aside from novelty shops and various body-part-shaking contests. The Mexican government has made great strides battling the cartels, and the department commends their continued commitment to that effort, but DPS urges Texans to avoid travel to Mexico. South Padre (SPI) is only 40 miles from Mexico. You can enjoy two destinations during your springbreak.were the drinkiing age is 18 and there are no expensive departure taxes, like you fill find in Jamaica, Cancun, Acapulco and Nassau. All (SPI) beaches are publicly owned and the consumption of alcohol is legally allowed on the beach (kegs included!). Students can BYOB and save money because you will avoid paying $8 per drink to the hotel beach bar. You can get around for free by riding on the WAVE! The Wave is a FREE fixed route system that operates in the City of South Padre Island and City of Port Isabel from 7am till 10pm! You can also get around using Beach Reach. Beach Reach an evangelism project providesFree Ride Vans until 2am each night during Texas Week/Spring Break. There are several clubs and huge bars like Tequila Frogs and Louie's Back Yard that help to make Spring Break in South Padre a major domestic destination for college students in the mid-west. There are corporate sponsored events during the day by Coke with their "Sprite Re-Mix" events, the U.S. Army's "Adventure Tower" obstacle course. These events are to be found behind the larger hotels like the Isla Grand Hotel. Many of the hotels have rooms with kitchens, you need to book early if you want one. Expect to spend between 200-300 dollars during your trip. Remember to protect yourself with SPF 15 Sunblock for day.